Allied Automation is A Proud Supporter of the 2017 St. Pius X Barn Dance Fundraiser: Bringing the Arts Alive at SPX! - Allied Automation, Inc.
Allied Automation is A Proud Supporter of the 2017 St. Pius X Barn Dance Fundraiser: Bringing the Arts Alive at SPX! Yee haw! 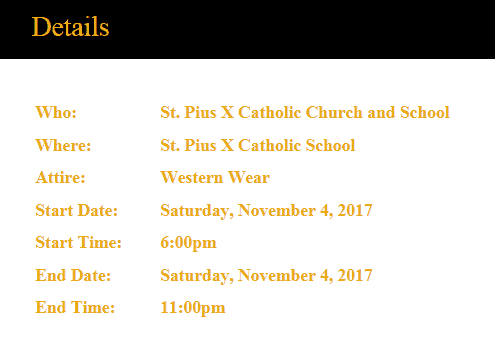 Welcome to the 2017 St. Pius X Barn Dance! We have a fun filled evening planned and we hope that you’ll join us. Each $75 ticket will include a family style dinner, drinks (beer, wine, liquor, soda, water). SPX cup, one game ticket, silent auction, Greta Speaks and late night eats! If you want to make sure you have a reserved sat with your friends and family, we are also selling tables of 10 for $1000 and tables of 8 for $750. Grab your partner and come on down for a fun filled evening where we plan to raise money to Bring the Arts Alive at SPX!